I just love him! I can't wait until he's finished - it feels like such an accomplishment :) I'm already planning what animals I want to knit next (very dangerous), so I need to hurry with this one lol. So those are my wips for this week. 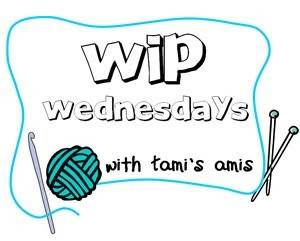 If you want to see what others have going on, check out Tami's Amis' blog! oh my, I cannot wait to see him in his full glory. Adorable!